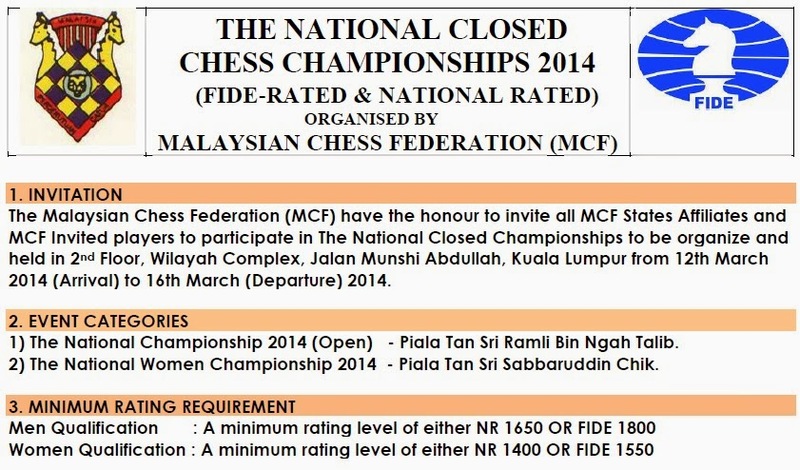 The prospectus of NCC2014 or 2014 National Closed Chess Championship has officially been released by MCF. The tentative playing schedule and venue. The complete prospectus can be downloaded from GiLoCatur Fan Club facebook group. From previous three entries, it is obvious that MSSD Petaling Perdana (PP) has won the most Gold medals in the team events. It had won three. It dominates the Under 12 categories. Meanwhile its twin, MSSD Petaling Utama (PU) dominates both Boys secondary school categories. Hence, the district won two Gold medals. The champion for Under 18 team event are MSSD Petaling Utama (PU) for the Boys section and MSSD Klang for the Girls section. Roshan Singh helps his MSSD PU L18 team to win the Under 18 Boys category. His other team mates are Shivendran Gandhi, Ethan Wong Hsien Aun and Teh Zee Hoe. Like MSSD PP L12 team, the MSSD PU L18 team had a solid performance. They won 17/20 games and all their five rounds. The fight is tough in the Under 18 Girls team event. MSSD Klang P18 team which comprises of Gan Xiang Hua, Sherene Kaur Seranna, Hong Hui Wen and Teo Sze Woon managed to edge MSSD PP P18 team even though having the same game (13) and match points (7). Congratulation to both champion teams. MSSD Petaling Utama (PU) and MSSD Petaling Perdana (PP) won the Under 15 team event for Boys and Girls category respectively. Comprising of Yee Jian Yang, Emir Rusyaidi, Kabir Singh and Bryan Yap, the MSSD PU L15 team emerged on top after winning three and drew two games. The team accumulated 14/20 game points. It is enough to put MSSD PP team in second place which was trailing by half point. 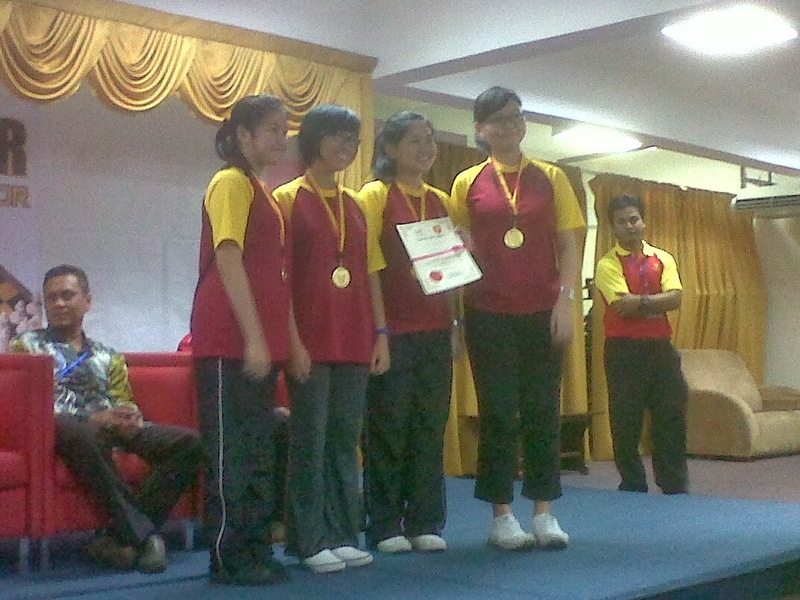 The MSSD PP P15 team managed to edge the defending champion in this category in last edition, MSSD Kuala Selangor (KS). 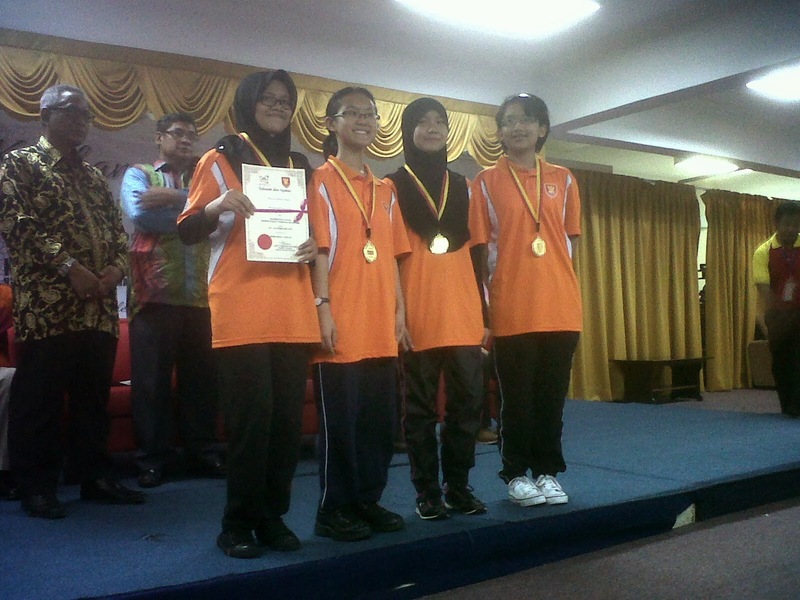 The team which comprises of Nurul Hana Syuhada, Lee MeiYen, Nurul Izzah and Sabrina Sofea won four games and drew one. With 13.5/20 points and having more one point than their closest rival, the team were smiling and happy to be on the podium as the Gold medal winner. GiLoCatur would like to congratulate both MSSD PU L15 and MSSD PP P15 teams for their respective achievements. MSSD Petaling Perdana (PP) dominates the Under 12 Team events in the MSSS chess championship which has just concluded today. Both its Under 12 teams - Boys and Girls, emerged as champion and thus won the Gold medals. Represented by three SKBJ pupils and one SK Seksyen 9 pupil, MSSD PP L12 team won all the five rounds scoring 17 out of total 20 points. For GiLoCatur, it was a solid performance. This team reminds GiLoCatur of the MSSD PP L15 team of 2010 edition that comprised of Low Jun Keat, Fikri Saleh, Suniil Kalivanan, dan Muhd Khidhir Muhd Zamani. The team won 18 out of total 20 points. Click here to view further info. The MSSD PP Girls Under 12 team is represented by two SKBJ pupils and one each from SK Seksyen 9 and SK Bandar Anggerik. The team won four games and lost 1, thus accumulating 8 match points. The team scored 15 1/2 game points, 1/2 point more than the first runner up, MSSD Hulu Selangor (HS). An interesting fact is that, there are three siblings pairs in the MSSD PP Under 12 teams. Congratulation to both MSSD PP Under 12 teams! The MSS Selangor chess championship for 2014 edition is entering its final day tomorrow. The championship started on Monday, 10th February. The championship is participated by 10 MSS districts and has six categories - Under 12, Under 15 and under 18 for each Boys and Girls sections. For each category there are four players for each districts. Mathematically, there are forty (40) participants for each category. Thus, since there are six categories, the total number of chess players compete in the championship is two hundreds forty (240). Each player will compete in two events - Individual and Team. Today, the Individual event completed. The participants play seven (7) rounds of one-hour-per player game in the Individual event. The first two rounds of total five rounds of the Team event had been played today. Three more rounds will be held tomorrow, the final day. For this event, the game format is 30-minute-per-player. 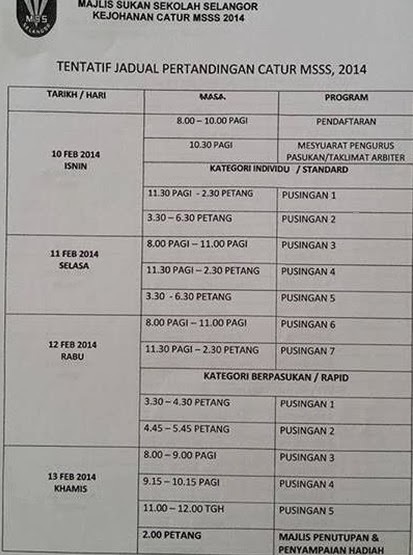 Below is the tentative schedule of the 2014 MSS Selangor chess championship being held at UKM Bangi. 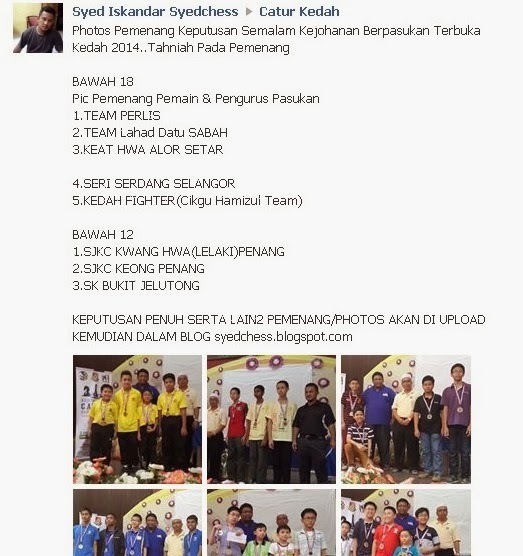 UM (Universiti Malaya) showed its dominance in Chess discipline in SUKIPT. It won all the four Gold medals offered in the sports event organized by the Ministry of Education (MOE). Muhd Syazwan Zulkifli and Alia Anin Azwa Bakri, a Woman Fide Master, won their respective Individual event. Syazwan won the Gold medal in the Men Individual event after 7 wins and 4 draws with better tie break than the first Runner Up, Ahmad Fadzil Nayan of IIUM. Both scored the same 9/11 points. Therefore, Fadzil won the Silver medal. While Muhd Nabil Azman Hisham from Kolej Multimedia Kuala Lumpur won the Bronze medal after scoring 8.5/11 points. While Alia emerged champion from eight (8) wins and three (3) draws in the Women Individual event. With 8.5/11 points she won the Gold medal. Ong Choon Yong and Ruby Kwan Tszee Yeung of USM (Universiti Sains Malaysia) and UPSI (Universiti Pendidikan Sultan Idris) are the Silver and Bronze medalist respectively. 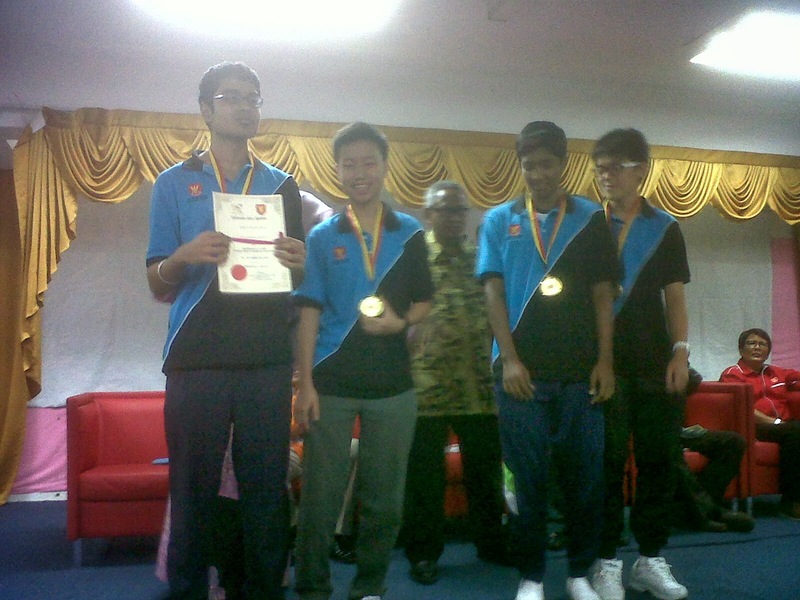 Both Syazwan and Alia led their respective UM chess teams to win Gold medal in the Team event. Along with Lim Kim Siong, Lum Zhun Hoong and Wee Zhao Liang, the UM chess team accumulated 29 points to be on top leaving Sunway University at the second spot (Silver medal). The latter just trailing by 1/2 point only. In the third spot is UTP (Universiti Teknologi Petronas). Meanwhile, Alia and her other team mates - Amira Syahmina Zulkafli, Ng Yun Hui and Leong Pui Yee, won the Gold medal in the women Team event after accumulating 29 points. They edged UPM (Universiti Putra Malaysia) and USM for Silver and Bronze medals respectively. GiLoCatur would like to say "Congratulation" to all the winners especially to the champions. All over Malaysia, MSS chess tournaments have been and will be held. In Selangor, the MSS district tournaments had ended. The Selangor MSSD chess contingents are ready for the MSS Selangor state level tournament to start next Monday at UKM Bangi. MSS Johor will hold its MSS chess championship during the final week of this month. 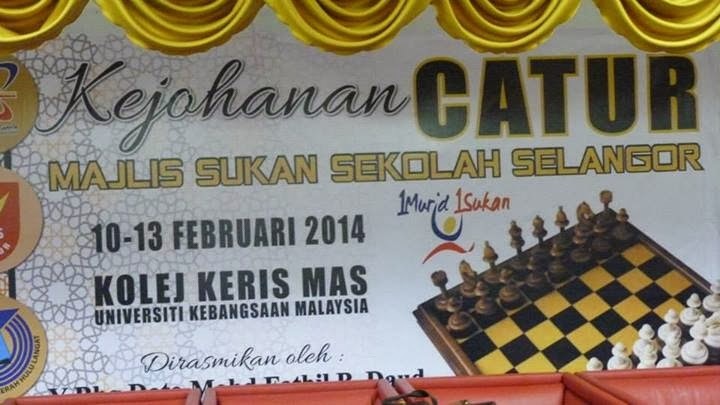 In Kedah, from facebook update the MSS district chess tournaments are on going. SUKIPT chess championship is also being held this week. SUKIPT is the sports competition for all Malaysian higher education institutions both public and private. The sports event is being held in Shah Alam. Chess is one of the 24 sports in the event. In a couple of minutes, the second final round will start. It is getting critical and crucial especially to all aspirant players who would like to represent Malaysia in this year Universiade. In the women section, there are 52 participants. The top seed is WFM Alia Anin Azwa Bakri from University Malaya (UM). She currently leads the pack by one point. Below is the Top 10 Ranking list after Round 9. In the men section, there are 80 participants vying for the champion. The top seed is AM Ahmad Fadzil Nayan from International Islamic University Malaysia (IIUM). Getting to Round 10, he is currently 3rd place in the Top 10 Ranking list after Round 9. The top two boards for each section is being shown live over the internet. Go to http://broadcast.kedaicatur.com/ to watch the games. GiLoCatur now has to accept that age is really catching up. Last night, GiLoCatur decided to stay up late to watch one of the epic BPL matches this season between Chelsea and Manchester City which started at 4.00AM, Malaysian time. After second half and Chelsea was leading one nil (1 - 0), GiLoCatur could not keep the eyes open. Finally, GiLoCatur lost to the dreaming world. :)- But GiLoCatur is really glad that the score was the same until the match ended. It is a big win for Chelsea. GiLoCatur really salutes the Special One for his genius game plan and strategy. GiLoCatur also amazes at Eden Hazard. At least now GiLoCatur has Hazard to watch since the departure of Didier Drogba, one of GiLoCatur's most favourite football players. 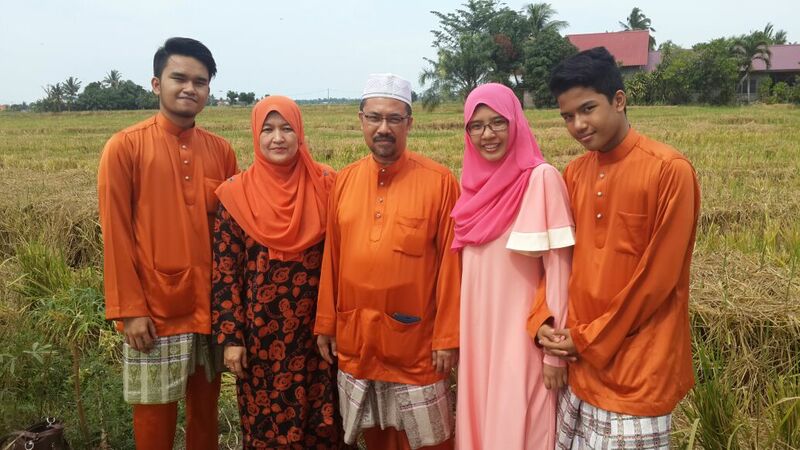 The Winners of "Kejohanan Catur Berpasukan Terbuka Kedah"
During CNY holiday, Fahim did not join his family going Balik Kampung. 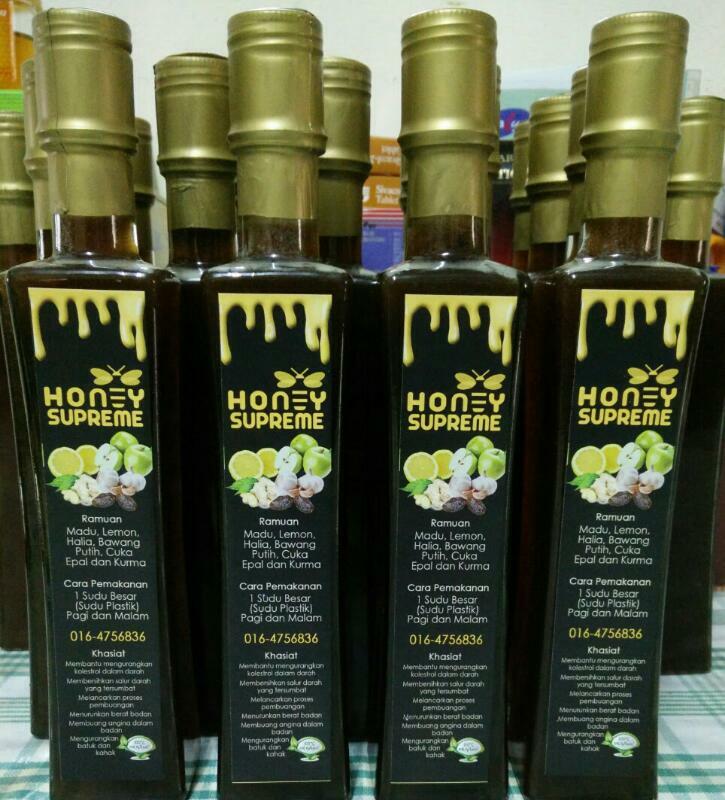 Instead, he along with his school chess team traveled to Kedah to participate in the Kedah Team chess tournament held on last Sunday. 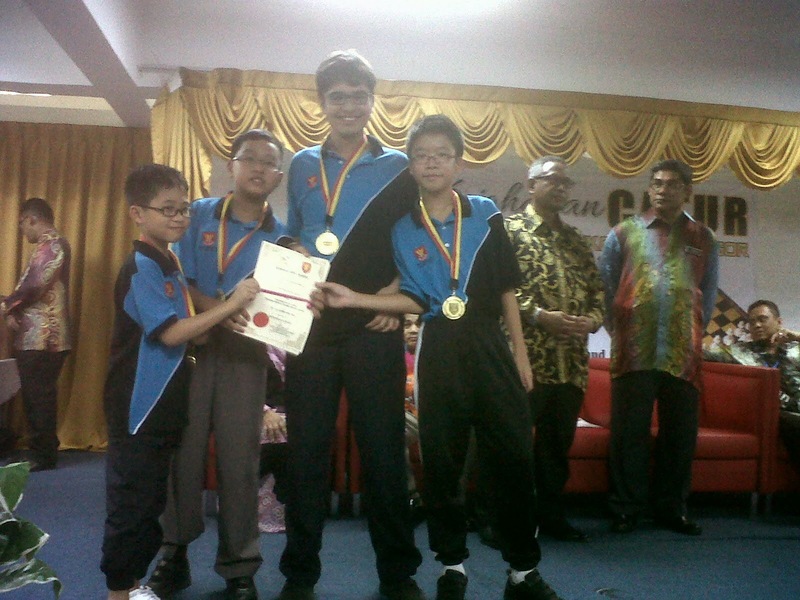 Alhamdulillah, Fahim's team emerged as the second Runner Up (third place) in Primary School (Under 12) category. Below are the winners in the chess tournament as per in Syed's facebook.